Courtesy of FairVote, here are the voter turnout percentages from Presidential and non-Presidential elections beginning in 1948. This year, 2014, is a midterm election or an election that does not include a Presidential race. 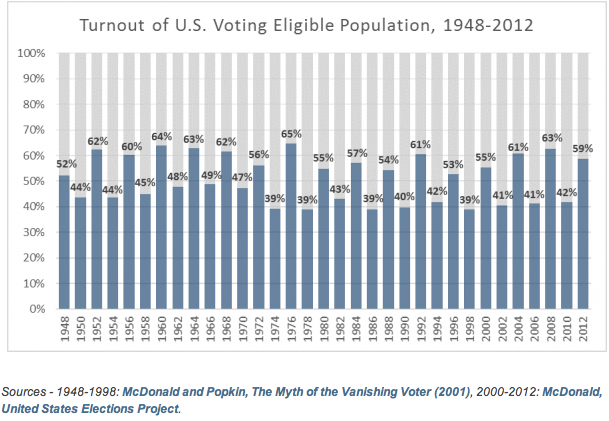 As you can see, elections in non-Presidential years have never experienced voter turnout over 50%. The best year was 1966 at 49%. Why do you believe that voter turnout in non-Presidential elections is so low? What do you think the national turnout will be this year? With the recent vote regarding Scottish Independence, it came to my attention that the minimum voting age for that referendum was 16 years old. About 100,000 16 year olds voted in that election. It is unknown how many, of those who participated, voted for or against independence. It is also unknown if Scotland will maintain the 16 year old threshold for future elections. At this moment, this experiment is a one-shot deal. In the United States, the minimum voting age is 18 years old. The 26th Amendment, which passed in 1971, made this happen. It was a time of social protests and unrest on many college campuses and cities. Young people, protesting the Vietnam War, were angry with the fact that they could not vote, but yet they could still be drafted into the nation’s military. Thus, lowering the voting age had a social and political motive to it. What would it take for the United States to lower the voting age to 16? Do you foresee this ever happening?